Instead of assigning backup policies, you can configure Veeam backup agent job settings for individual managed computers. The target location where you plan to store backup files must have enough free space. Available backup job options depend on the Veeam backup agent operation mode. For details, see Product Editions. The number of jobs that you can assign to a Veeam backup agent depends on the product edition. For details on the limitation of the number of jobs, see Backup Job. [For Veeam Backup & Replication repository targets] You can store created backups in a backup repository only if the backup server runs Veeam Backup & Replication 9.5 Update 3 or later. [For Veeam Backup & Replication repository targets] If you plan to use a Veeam Backup & Replication repository as a target for backups, you must pre-configure user access permissions on this backup repository. For details, see Setting Up User Permissions on Backup Repositories. You cannot save the backup of entire computer on the local computer disk. Use an external hard drive or USB drive, network shared folder or backup repository as a target location. Veeam Agent for Microsoft Windows does not back up data to which symbolic links are targeted. It only backs up the path information that the symbolic links contain. After restore, identical symbolic links are created in the restore destination. Choose the necessary computers in the list and click Create Job at the top of the list. Choose the necessary computers in the list and click a link in the Successful Jobs column. In the Agent Jobs window, click Create Job. 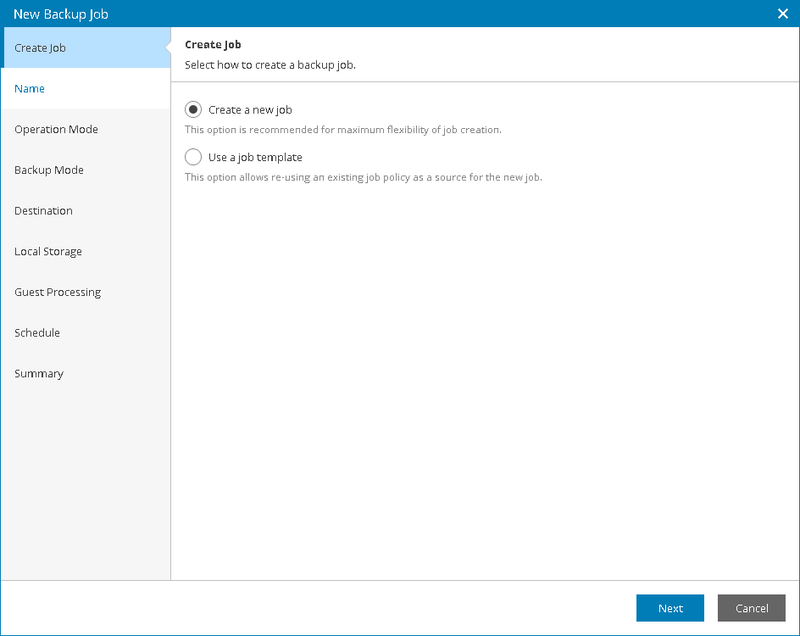 Select this option to create a job configuration from scratch. Configure Veeam backup agent job settings as described in Creating Backup Policies. Select this option to use an existing policy as a template for job configuration. At the Backup Policies step of the wizard, select a backup policy on which the backup job will be based. Veeam Availability Console will assign the policy to the selected managed computers. When you create backup job configuration from scratch, some configuration steps may differ from steps available for backup policies. For example, at the Cloud Repository step, you can choose a specific cloud repository as a backup target. In backup policy settings, this possibility is not available.